Having grown up on a council estate in the south-eastern corner of the capital city and always been a lover of the urban environment, it was a surprise to me on moving to the East Sussex countryside a dozen years ago to realise that my appreciation of the cityscape had been overtaken by the feelings the rural aesthetic could inspire in me. Whereas in the city it was those large-canvas sights - the twinkling lights of the office monoliths on the Isle of Dogs viewed from Greenwich Park, the sunset view up and downriver from Waterloo Bridge – that stirred me, in the countryside it is the smaller-scale that stimulates. Not for me Arcadian pastoral vistas and roses-around-the-door villages much-loved by traditionalists and those who would seek to preserve the countryside in aspic; instead, it is those minor details, the simple pleasures that take me unawares: a gently curving bend in an undiscovered country lane that hints at promise around the corner; a house on a rising piece of land newly revealed behind a freshly-cut hedge; an abandoned piece of agricultural machinery in a field symbolising the power of nature in its relationship with man. 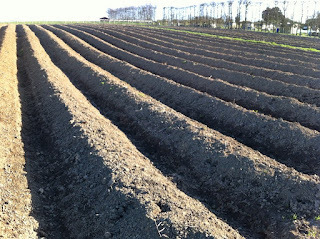 And on a spring afternoon this weekend, a just-ploughed asparagus bed, with its deep shaded furrows and sunlit ridges streaming away from me, reminded me that, in this week of weeks, the horizon is filled with the unknown.